This is a quiz program. The program allows you to answer up to 10 Java programming basic questions. Then it displays a report that shows all questions, their correct answers, answers selected by the user, and the number of correct answers. The program uses two two-dimensional arrays, one for storing pairs of question and its possible answers, and another one for storing pairs of question and its correct answers. The answer selected by the user of a question is added in the HashMap object for the report. 1 Initialize questions, possible answers, and correct answers. 2 Set the title of the program window (Quiz Program). 3 Let the program window close when the user clicks the close button. 4 Specify the width and height of the program window when it opens. 5 Specify the location of the program window when it opens. 6 Disable program window resizing. 8 Set the layout of the container to null so that you can customize the locations of controls to place on it. 9 Set the background color of the container to the gray color. 10 Create the ButtonGroup object to hold the JRadioButton objects. 11-18 Create four JRadioButton objects and add them to the ButtonGroup bg. The radio buttons allows the user to choose the correct answer. The radio buttons are placed in the ButtonGroup to make sure that only one of the four answer choice can be selected. 19 Create a JLabel object lblmess to display the question. 20 Set the text color of the lblmess to the blue color. 21 Set the font name, font style, and font size of the lblshow label. 22 Create the JButton next object to enable next question. 23 Set the text color of the next button tot the green color. 24 Add action event tot button to enable button-click action. 25 Create the JPanel panel object to hold the controls (label, radio buttons, and button). 26 Set the background color of the panel to the light gray color. 27 Specify the location of the panel object. 28 Specify the width and height of panel object. 29 Set the layout of the panel to a grid layout with 6 rows and 2 columns. 30-35 Add all controls to the panel object. 37 Make sure the program window is visible. 38 Initialize the question id. 39 Display the first question (id=0) and its answers choice to the user. 40 The actionPerformed method of the ActionListener interface is rewritten to handle the button click event. 41 Initialize the qpa and qca arrays. The qpa array stores pairs of question and its possible answers, and qca array stores pairs of question and its correct answers. The HashMap object also created. It will be uses to store the pairs of question and its selected answer. 42 The getSelection method returns the answer selected by the user from the answer choices list. 43 The readqa method is invoked to set the question to the lblmess, and answer choices text to the four radio buttons. The first radio button is selected by default. 44 The reset method reset the program back to its first load state. 45 The calCorrectAnswer method return the number of answers that are answered correctly. 46 The Report class extends JFrame. The report window is displayed when the user complete all questions and clicks the btnext button (label Show answers). 47 The Draw class extends Canvas. It is an inner class of the Report class. The Draw class is used to display the output to the user. 48 The QuizProgram class the main method to start the Quiz program. 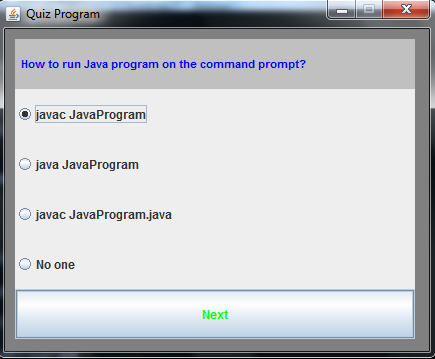 do we save this program as Quiz.java or QuizProgram.java. You will save the program as QuizProgram.java since the QuizProgram class contains the main method..
You should create a moveNext method to move to the next question.You will use the Thread.sleep (5000) to delay then call the moveNext method to move to the next question. Sorry am very new to java...could you please give the code for the timer and where in the program should we insert the code for the gui timer?? You can read the full code from the link below. It delays a question five seconds then automatically move to the next question. I have one error reply asap plsss! Superb Blog. i like your post. Hi.. Am new to java. Having a task that timer need to run inside the frame & @ the result Time taken need to be displayed. Can anyone plz help me out ASAP. Sorry New to JAVA. Is it possible to randomly select questions from a file ? how does it get the correct answer? i mean if you pick the wrong answer how will the program know it it's right or wrong? i do agree your blog for quiz programming concepts, which is very helpful to grow up your knowledge. keep sharing more. you can get more quiz questions from below link. Great work Sir! 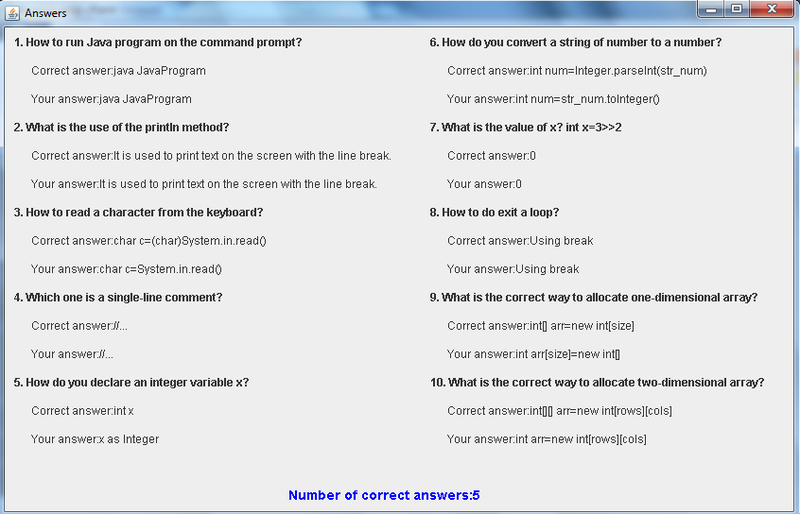 But my prof. want the questions to be in jumbled (in different sequence) every time the user restart the quiz program. What part of the program will I edit? What codes will I add? Sir please help. Nice work bro! Can I ask you for the class diagram of this program? Thanks! how to create a different question if you finished the Quiz? If your web site is on the discussed server, it'll share server assets along with additional web sites on the same server. This could be the most inexpensive solution, but can result in the worst overall performance if other websites are hogging your sources. These are typically not suggested if you are attempting to run an e-commerce site.I wondered upon your blog and wanted to say that I have really enjoyed reading your blog posts. Any way I’ll be subscribing to your feed and I hope you post again soon. Quite Interesting. The content is too good and informative. Thanks for sharing. Thanks for taking time share this page admin, really helpful to me. Continue sharing more like this.